Round 11 Review - is a gap finally opening up? Round 11 Review – is a gap finally opening? Are we finally seeing a gap opening up between the top five and the rest? A round in which every result saw a team already in the top five knock off a team from outside the five, has seen that possibility emerge. UNSW Eastern Suburbs were the biggest winners for the round. 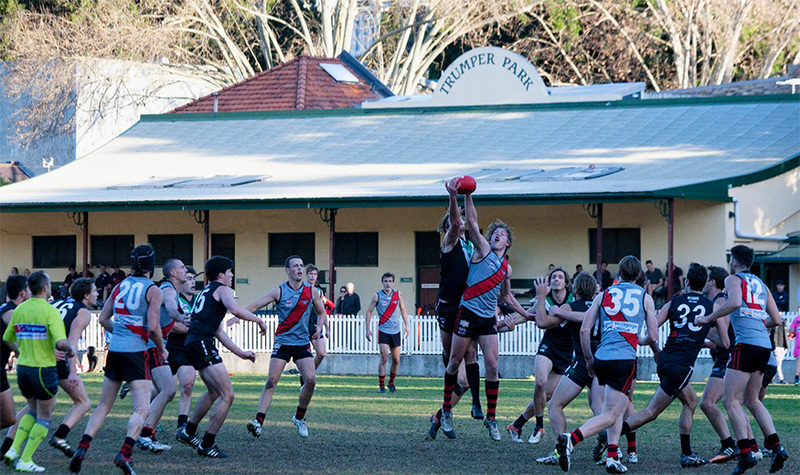 The Bulldogs’ opponents were Western Suburbs and the match was played at Picken Oval. This season has been one in which the Bulldogs have risen up the ladder to become genuine contenders. They rose to second spot several weeks ago, and have increased their lead over third with every passing week. Saturday’s win – their fifth on the trot – was their biggest of the season to date. The Magpies went into the game with winning form after beating Manly-Warringah last week. Though it did not take long for it to be clear, that there would be no repeat this time around. The Bulldogs were looking the stronger team around the ground in the first term, and the Magpies were always chasing the game. The Magpies tried hard to put up some resistance but were struggling to make any tangible impact, as the Bulldogs were finding room to move. With four goals to one in the first quarter, and an 18-point quarter time lead, the Bulldogs were looking good. The second quarter followed a similar trend to the first. The Magpies were trying hard, but their efforts were consistently coming unstuck against the relentless pressure of the Bulldogs. The Magpies were struggling to penetrate their attacking 50 metre zone, while the Bulldogs were making frequent incursions at the other end. It was already looking comfortable for the Bulldogs at half time, but the difference between the two sides was even more stark in the third quarter. The floodgates had opened, and the Bulldogs were scoring at will. The Magpies were powerless to stop the one-sided display that was unfolding, as the Bulldogs completely outplayed the Magpies in every facet of the game. A return of nine goals to two in the third term blew the margin out to 80 points at three quarter time, and victory for the Bulldogs was assured. The final term would yield nine unanswered Bulldogs goals, as the Magpies’ defence crumbled beyond recognition. In the end, the margin was a comprehensive 136 points. Steven Pollock spearheaded the charge with six goals, while Justin Cann showed his ability with five goals in a best on ground performance. Luke Irvine and Jake Bartholomaeus also featured prominently. The Bulldogs are just a game behind Sydney University and two and a half games clear of third, as the double-chance in the finals draws closer. Reuben Haupt, Peter Maxwell and Yannick Milligan-Saville were impressive for the Magpies despite the heavy loss. Two games outside the top five and with a poor percentage, it is still possible for the Magpies to make the finals, but they will need to regroup quickly to restore their finals hopes. GOALS: UNSW-ES – S Pollock 6, J Cann 5, M Thompson 3, L Irvine 2, K Reynolds-Erler 2, J Deep 2, S Wilson, M Lower, J Daniher, J McLean, B Pattison, J Wachman. Wests – R Haupt 2, B Mumme, J Nieser. BEST: UNSW-ES – J Cann, L Irvine, J Bartholomaeus, M Lower, J Daniher, J Deep. Wests – R Haupt, P Maxwell, Y Milligan-Saville, C McEvoy-Gray, D O’Connell, L Davis. Meanwhile at Trumper Park, UTS’ season continued to unravel as they slumped to their seventh straight defeat, falling to North Shore by 38 points. It was tight early on. The Bats were desperate to make an impression, and it was not easy for the Bombers to assert themselves on the contest. Had it not been for some inaccurate finishing by the Bats, they may have been able to take the lead and put some pressure on the Bombers. 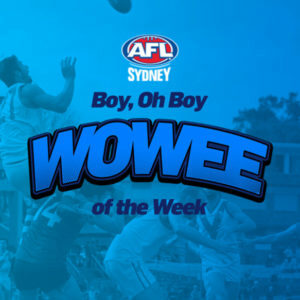 That was not to be, and although the Bombers did not look totally convincing in the first term, they managed to kick four goals to two, and lead by 11 points at the first change. The decisive break came in the second quarter, as the Bombers lifted their work rate and pumped the ball into their scoring zone. It was the quarter that would produce the best football in what was generally a scrappy contest. The Bombers were well ahead at half time, but were unable to go on with the job in the third term. The Bats would win the quarter, but not by enough, to get back into a winning situation. It was a quarter in which each team would kick three goals, with the Bombers leading by 31 points at three quarter time. North Shore have fallen over in some games after being in a winning position, but against a side on a long losing streak, they had enough of a buffer not to be any serious danger this time. The Bombers would increase their margin in the last quarter as they kicked three goals to two. It was not a game that reached any great heights, but a 38-point win was enough for the Bombers to be safe from the fear of an upset result. 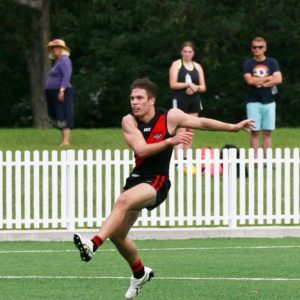 James Cubis, Andrew McConnell and Chris Murphy were best for the Bombers in a game where they never looked totally convincing, but still did enough to record a comfortable win. A result that saw them move half a game ahead of St George, although the Dragons have a game in hand. The Bats were well served by the efforts of Louis O’Keefe, Scott Jansen and Brendan Browne. The loss was their seventh in a row, leaving them stranded at the bottom of the ladder, and now three games out of the top five. It is still mathematically possible for them to make the finals, but time is running out. GOALS: North Shore – A McConnell 3, H Carr 3, W Blackburne 2, M Wilson 2, J Loneragan, W Taylor, D Fitzgerald, E Strudwick, K Devlin, M Manteit. UTS – T McKenzie 3, F Cator 2, P Brennan 2, E Thwaites, W Thompson. BEST: North Shore – J Cubis, A McConnell, C Murphy, E Strudwick, M Wilson, D Fitzgerald. UTS – L O’Keefe, S Jansen, B Browne, H Callahan, J Macklin, T McKenzie. 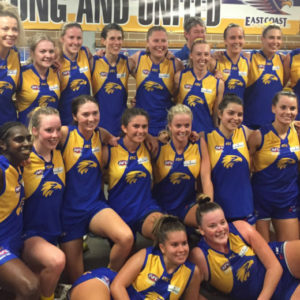 When the East Coast Eagles hosted Pennant Hills, the situation was clear for both clubs. The winner would be in the top five at the end of the round, the loser would not. It was ‘Past Players Day’ at Kanebridge Oval, with former Eagles players returning to the club to exchange anecdotes of past glories, and witness the present-day Eagle players who inherited their legacy. The clubhouse on the eastern side of the ground was packed, providing a great atmosphere for the action that was happening on the field. The first quarter action was tight and tough, with neither side able to establish any form of superiority. The Eagles led by three points at the first change, after an evenly-contested first quarter, which would produce a result of two goals apiece. The Eagles would pull away in the second quarter, delighting the crowd. A return of four goals to one in the second term would stretch the home side’s lead to 22 points at half time, in a quarter where both teams would get plenty of the ball. The Demons knew when they returned for the third quarter that they would need to take some risks, to throw caution to the wind and step up their attacking efforts. The third quarter would be their most productive in the goal-scoring stakes, as the Demons would draw twin flags from the goal umpires three times. However, the Dees would only win the quarter by one-point, cutting the Eagles’ lead to 21 points. As the sun set around them, the Eagles were as relentless at night as they had been in daylight. They were in clear control, adding three unanswered goals in the final term to blow the final margin out to 37 points. The Eagles had remain in the top five, a game and a half ahead of Pennant Hills – albeit with the Demons still having a game in hand. The Eagles could thank the efforts of Jamie Vlatko, Kieran Emery and Peter Vlatko for getting over the line for another win. After dropping behind the pace early in the season, the Eagles have now got back to win-loss parity, and have established themselves in the top five. The defending Premiers are back in form, sending a warning to the rest of the competition. Josh Boag, Luke Skrivanic and Daniel Witt worked hard all day for the Demons. The loss for Pennant Hills sees them stuck six points outside the top five. It has been a long time since the Demons have missed the finals, but there is plenty of time for them to get back into the top five this year. GOALS: East Coast – M Weekes 3, Jamie Vlatko 2, L Gemmill, D Spiteri, Jon Vlatko, J Taylor, A Savage, S Turner. Pennant Hills – T Moraitis 2, L Skrivanic, D Dell’Aquila, N Hey, M Preen. BEST: East Coast – Jamie Vlatko, K Emery, P Vlatko, S Turner, A Savage, A Browning. Pennant Hills – J Boag, L Skrivanic, D Witt, T Angel, T Edmonds, T Wales. Sydney University remain on top of the ladder, with just one loss this season. 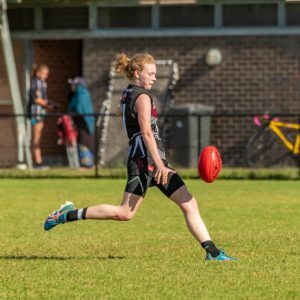 Their eighth win in a row came at Weldon Oval on Saturday afternoon, in a game where the Students had to battle against not only Manly-Warringah, but also their own wasteful finishing. The first quarter was a scrap. The Wolves went in hard and attacked the ball at every opportunity, causing packs to form around the ball. The quarter was full of ball-ups and boundary throw-ins, but very few uncontested possessions. The Students would kick the only goal of the quarter to lead by eight points at quarter time. The game opened up in the second term, with the running players getting more of the ball. The Students – despite creating the majority of scoring chances – would frustrate themselves. Shot after shot sailed wide, as the Students’ goal kicking radar failed them, scoring 2.8 for the quarter. At the other end, the Wolves would make better use of their fewer opportunities to score four goals for the quarter. At the long break the Students led by three points, although the Wolves had scored more goals. After putting the Students under pressure during the second term, the Wolves were unable to continue the trend of play, when the premiership quarter came around. Instead, the Students consolidated their position with five unanswered goals. Despite also continuing to miss several shots that they would normally have been expecting to kick, the Students pulled away to lead by 36 points at the last change. The final winning margin for Sydney University would be 40 points after each side kicked three goals in the last. Luke Vella, Kane Murphy and Mitchell Mahady were ball magnets for the Students, as they maintained their spot on the top of the ladder -a game clear of UNSW Eastern Suburbs. Wills Brassil, Lachlan Kilpatrick and Anthony Robertson were the best for Manly. The loss sees the Wolves fall two games – plus plenty of percentage – out of the top five. If the Wolves are to hold hope of competing in this year’s finals, they will need to string a winning streak together before too long. GOALS: Sydney Uni – H Morrison 3, M Krochmal 2, A Clarke 2, J Stapleton, D Johnson, S Krochmal, L Vella. Manly – H Washington 3, M Rogers, L Behagg, L Brain, R Wearne. BEST: Sydney Uni – L Vella, K Murphy, M Mahady, S Clark, M Krochmal, S Krochmal. Manly – W Brassil, L Kilpatrick, A Robertson, T Armitage, C Johnston, H Washington.